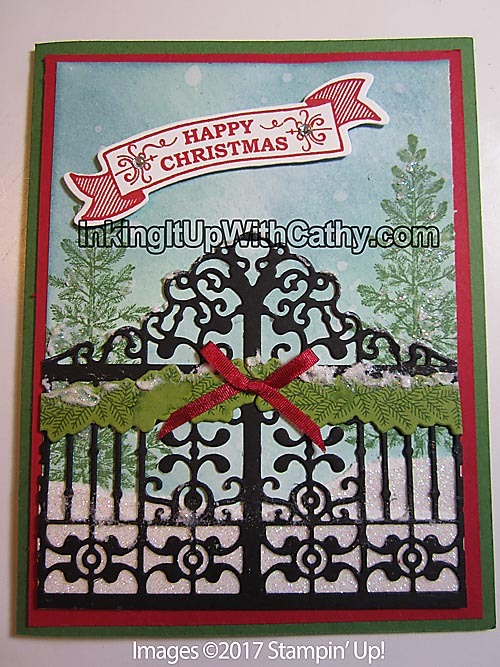 When this Gate die came out in the Holiday Catalog did you see a Halloween card? Not me! This is what I saw - a snow covered gate as part of a winter scene. The Ready for Christmas stamp set offered up the perfect pine boughs to add to the scene. Oh and when I saw the embossing paste, I knew this was going to work! 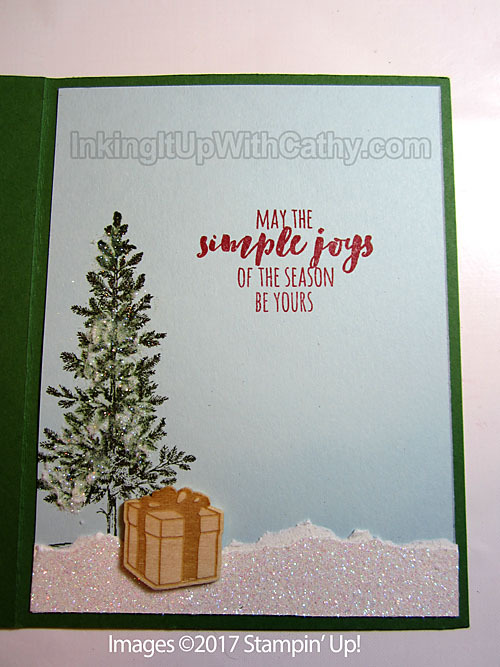 To make this card, you will have to grab several stamp sets though - a tree from Lovely as a Tree, a Christmas banner from Seasonal Bells, Christmas Pines for the inside sentiment and the pine boughs from Ready for Christmas. To make the card, I first took a Whisper White 3 3/4" x 5" piece of paper and sponged it with Pool Party ink. I then added a small amount of color using Marina Mist. I then took a spritzer and created a snowy scene when the water smeared the ink a bit. Once it was dry, I stamped the two trees using Garden Green ink and placed some Dazzling Diamonds Glimmer paper along the bottom. I then placed the gate on the card (which had the multipurpose adhesive sheets on the back). I stamped the pine boughs using Garden Green ink on Old Olive card stock and cut them out using the coordinating die. I attached them to the gate on either side - trimming off the excess. I then got one of the spatulas and put a small amount on embossing paste on the tip and gently tapped along the top edges of the horizontal parts of the gate and also the trees. While the paste was still wet, I sprinkled it with Dazzling Diamonds Glitter. A red ribbon in the center finished it off.